DC Shoes and Nissan have collaborated to create “The Headlight Sessions” in a new video which brings together some of the best and most famous skaters in the world with Nissan’s new Juke NISMO RS. Most famous of the skaters is the 2014 Thrasher Skater of the Year Wes Kremer who does his usual tricks whilst his path is illuminated by the Nissan car. DC Shoes‘s well established skateboard film director, Chris Ray, has managed to urbanise the Juke NISMO RS by displaying it in this dark-filled, close-spaced way. 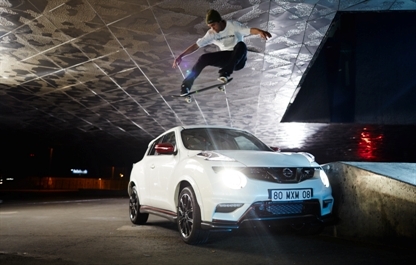 It not only established the prowess of the skaters but also highlights the Nissan’s manoeuvrability and sleek features giving the impression that it is the perfect car for city life. Nissan’s Marketing Vice President in Europe, Bastien Schupp stated that “Combining the core urban roots of Juke NISMO RS and the skaters has created a compelling video and showcases the car’s dynamic, sporty crossover design DNA and enhanced engine power in a powerful way.” The video, displayed above, is compelling beyond a usual partnership and there is something, almost like chemistry, between the skills of these famous skaters and their partnership with the Juke NISMO RS. It’s clear that Chris Ray new exactly what he was doing as they undoubtedly compliment each other in an effortless yet mind-blowing way. The final clip showing a powerful jump over the smartly parked and illuminated Nissan neatly sums up the partnership between these two global companies and the suggestion is that their future together should be very bright indeed.